Thanks to the experts at idiottoys.com I now know I need a new shopping trolley. Especially if it comes with all the accessories. Suddenly, I seem to be making a huge number of holiday plans. Friends want to spend Whit week camping in Yorkshire. More friends on Thingbox are suggesting we head to Glencoe for a week’s camping in midge country. And/Or Shell Island with Out. And/Or maybe Pembrokeshire. Then some of P’s friends work as holiday reps on Crete, and we wanted to visit them at work. A really interesting offer has also arisen to go and see Munich again – I’ve not been there since I was 14 or so. Munich is quite tricky to get to by budget airlines, but someone came up with a wheeze to fly Ryanair from EMA to Salzburg and take the ICE to Munich. It’s less than two hours and less than €30. Or… if we end up flying to Crete, and flying is bad, mm’kay… Munich would be about 12 hours by rail from Nottingham. 12 hours on a train! It’s an incredible three changes – Nottingham -> London -> Paris Nord -> Paris Est -> Muenchen. I’m guessing that would be quite a lot more expensive as well as time consuming. But it could be the test trip using Eurostar from St Pancras, which I am very keen to do. I still have friends in Sweden and Spain I’m itching to visit. We didn’t go to see our friends in Normandy last year either. Normandy could be another chance to use the Eurostar, but it is a bit of a pain to go all the way to Paris then all the way back out to Caen. Oh – and all that’s not counting Lib Dem conference – in Liverpool in a few weeks and Bournemouth in the Autumn. I do know people who take tents to conference to save money, but I tend to take a lot of expensive kit like laptops and cameras that I would be nervous about leaving under canvass. The planet is too big, and time and money are too short. I’m definitely getting me one of these from USBWine.com. I have over a full year of Google Analytics data for this site now, and I have spent an hour today pulling through the data. The key thing I get out of it is the disparity between what I think this site is for, and what the data shows other people use it for. Anecdotally, people at work who read this often stop me in corridors and talk to me about it. A lot of people love it – use the quizzes, follow the links, look at the photos. Some other councillors like the recipes. Some councillors however just can’t see the point. They think it’s weird and don’t understand why people bother to read it. Now I have a lot of data to pore over to see what’s going on. I got an average of 80 hits a day, with a huge peak on 5th March. 66% of them got here after using a search engine, predominantly (in fact 89%) Google. The average reader spent less than a minute here, suggesting they typed something in to google, came here, and either found what they were looking for or didn’t, and went off again. 22% of readers came here because they’d followed a link on someone else’s site. These readers spent more time here – more like over a minute each. Finally, 11% came here because they wanted to. Called “Direct Traffic” in Analytics, these are the people who are here because they typed the URL into their browsers directly. You must be my real readers, so thank you very much! Of course, it’s slightly more complicated than that. The people who came here through links in Bloglines are the people who’ve decided they want to follow the info here. The people who put “alex foster” and “niles’s blog” into Google also wanted to come here, but couldn’t remember what the website was. And the people who went to http://www.niles.org.uk – really need to update their bookmarks! The referrers are interesting. Some are understandable: libdemblogs is designed to send more traffic to people like me. Iain Dale is interesting – I’m listed as one of many in his links, but in the last year, as far as I can see, he hasn’t actually written about me at all. The year before, he was bigging me up enormously, and my traffic reflected that, but it’s interesting he can send substantial traffic my way without even talking about me! “Facebook” in the google search terms is similarly weird. At one point in the year I blogged that I had joined facebook. For several months after that, I was top of the list if you googled facebook. I was ahead of the actual facebook website. Bizarre. At the end of the day, however, you just have to hand it to the 957 people last year who wanted to make pear crumble. I really recommend the recipe! My electric meter reading yesterday afternoon was 000000! This is because Eon contacted me at the start of the new year and said it was time to replace my electric meter, which had reached the end of its life. On the way, we also lost our radio teleswitch. No more thunks at 8am as the house is remotely switched off the Economy 7 tarif. I was a little annoyed that the meter is so basic. 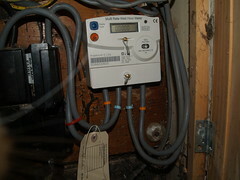 Routine meter replacement is an ideal opportunity to put in better meter technology. 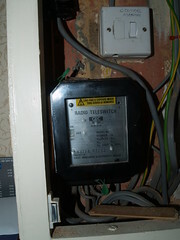 I was hoping for a smart meter which could be read remotely and give feedback on energy useage. Or at least relocation out of my hall, so that I no longer have to be home to have my meter read. 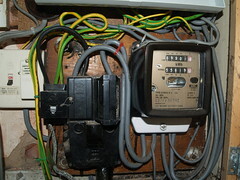 I suspect the lack of a smart meter means it will have to be replaced again before long. The city council has been using remote smart metering extensively in the huge number of buildings the council is responsible for. This has helped them reduce costs and waste by monitoring energy and water use on an hourly basis. You know that a school using lots of water in the holidays has a leak, or has forgotten to turn off 15 minute flushing urinals that aren’t being used. Back home, the measurements nerd in me is chuffed with a meter that briefly read 0. We have now used about 10kWh in our first day. I have no idea whether this is good or bad, but I do know that visitors to our house have sometimes been surprised at the lights we have on. Being green is as much about reducing routine energy useage as installing novel technology such as the solar panel. In assessing our own energy useage, there’s good and bad to report. We routinely turn our telly off as we’re advised to. But I leave more computers running all the time than I should. Additionally, we do have a lot of lights on. This is partly because we forget to turn them off, but also because of a tension between green advice and safety advice. The green advice is turn off everything you’re not using. The community safety advice is try to avoid being burgled by using time switched and lights to make it look like someone is home. And further safety advice says things like leave the landing light on when you have visitors to prevent people unfamiliar with your home from falling down the stairs. One last thing on energy monitoring: last year we switched away from Good Energy, the green supplier that gave kickbacks to the Lib Dems. This was mainly because we could no longer afford to pay the extra cost that came from having our gas and electricity supplied by two different companies. I’m now on an internet-only tarif with Scottish Power, which is useful firstly because they now email me when they want meter readings, and secondly because their online account details include previous data. This helps you manage your useage across years – how many kWh were you using this time last year? By logging in, I can see we averaged 12kWh a day for the two quarters we have data for. My favourite peeress Baroness Ros Scott has started a blog this week – using one of my favourite Blogspot templates. You can find her writings here. She’s not the only Lib Dem member of the House of Lords to write a blog. Eric Avebury – Lord Lubbock – can be found here. And you can still find the writings of Lord Garden here – but his sad death last year means he won’t be updating any more. France’s employment policy is so wrong-headed that it forces tens of thousands of young French people to the UK. So many in fact that in terms of population of French people, apparently London is the 8th largest French city. By contrast, France has a much better climate than the UK, so Britons buy houses over there in droves – for holidays and for retirement. 600,000 of them, apparently.